The lack of posts recently can be somewhat attributed to the vagaries and long lists of summer, and somewhat attributed to a bit of farm excitement that happened early in July. I didn’t want to post until I had a complete story, and the story dragged on somewhat. We had planned to take delivery of our replacement steers from our neighbor a few days after harvest of the last ones, in early July. Harvest went well, and by all accounts, as well as the data from the processed weights, the beef turned out better than it ever has. After a few days downtime, we arranged to have the new cattle brought over. It was in the early stages of our July heat spell, with temperatures in the 90-95F range. We chose a day that was relatively cool (90F), but obviously not cool enough. The steers were exceptionally skittish (never a good thing in a 800lb beast), due to the heat, as well as the fact that the neighbor had just cut them out of the main herd a day before, so they had never lived by themselves before. One of the steers was a twin, and always hung out tight with his brother. The topping on all this was that there was a yellowjacket nest just outside of the corral where they were acclimating that got run over by the delivery truck. Hot worked up cattle…hot worked up yellowjackets. Get the cattle more worked up, get the yellowjackets more worked up. You see how this goes. They lasted about an hour and a half, when while I was watching, their circling of the pen accelerated until one of them reached escape velocity…namely, enough bravery to dive into a woven wire and electrically charged fence. Where one goes, the others follow, so the end result is a gaping hole in the corral and a small herd of steers running down the road. But it doesn’t end there. 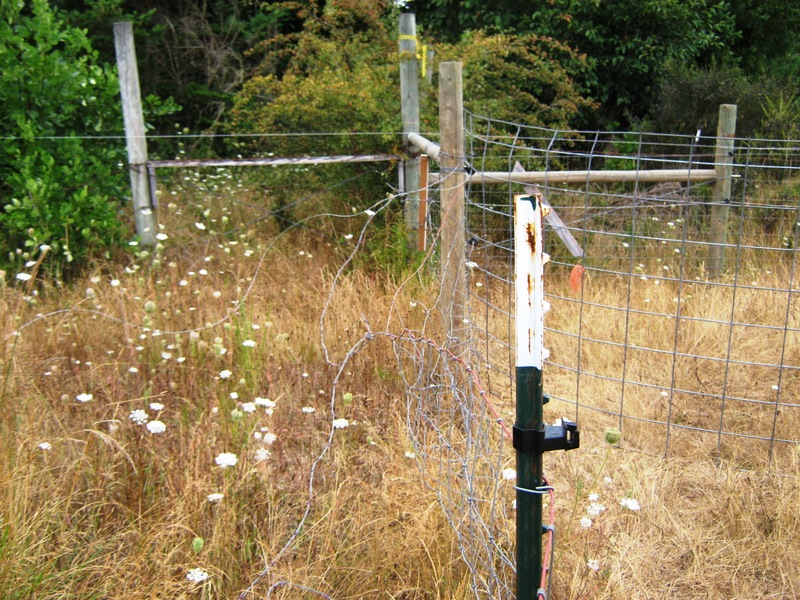 Fortunately, the neighbor’s adjacent pasture was empty, and had a gate located on the road…a quick zip ahead of them to open the gate, and a little light pressure, and they were in, if not in my pasture, at least contained and safe. So the next day I spent the afternoon in the scorching 95+F heat, patching and beefing up the hole in the corral, as well as dispatching the yellowjacket nest. The neighbors loaded up the boys again in the relative cool of the evening, and we brought them back to the now woven, plus barbed, and twin electrically charged corral. And they stayed there….for about 8 hours. Come morning, I was walking about a couple hundred feet away to check on them, and they decided that I was the cause of all of their discomfort the previous day. Escape velocity was reached again, through the beefed up corral, in the exact same spot they went through the first time. 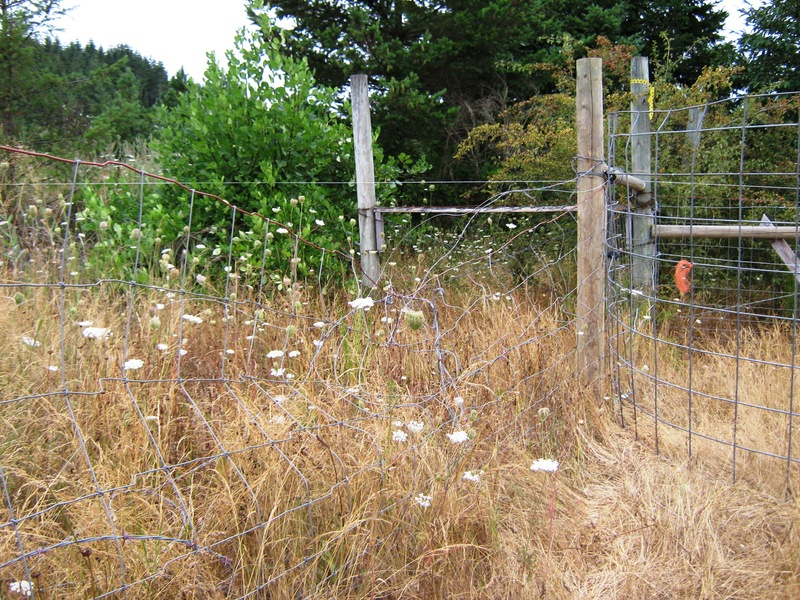 This time, however, they didn’t want to use the convenient gate to get back into the neighbors pasture…they saw some shade in his trees, and bolted over an old fence into some thick doghair fir and vanished…for 2 days. The thought of losing a few thousand dollars of beef on the hoof to the vagaries of the Coast Range was fairly disheartening, to say the least. Add to that the inevitable stories of the ghost cattle in the rain that people would tell for years afterward, and I was getting pretty bummed out. A couple of days later, we managed to coax them out of the shady trees, and back into the neighbor’s barn…again. Rather than banging our head against the wall…again, we opted for the charm offensive…the steers stayed at the neighbor’s where they grew up, where there was good shade, a big bale of hay, and I’d go over there once or twice a day to give them treats and get them to associate me with good things. After a couple of weeks of that, they would walk right up to me and nudge the bucket, hoping to get some alfalfa. Now that the weather has cooled off, it seemed that we were on track. So last Thursday night was the big test…around 8pm, we loaded them, again. Drove them over, again. Instead of the little corral, we gave them half of our big pasture. At first, I thought we were going to be starting from zero (or worse) with them…when I’d show up, they would trot down to the far end of the fence and watch nervously. But, at least they stopped at the fence. Now (Weds), they are pretty interested in me, and while still cautious, can be coaxed to walk up to within 20′ of me to eat some alfalfa treats. 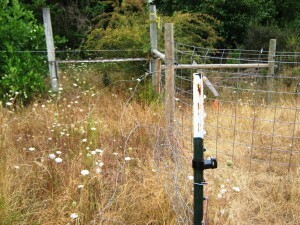 The next step is to rotate the pasture in a few days…hopefully I won’t have a story then, too. Holy hell, Rich. Trainwreck, indeed! Through all of this is the portrait of one dedicated, level-headed and patient rancher. I sure hope that’s the last of the hooplah in their integration, but sounds like a lively group! And to think, I was miserable enough on that hottest of hot days just sitting in front of a fan, drinking fluids, and reading… You’re one tough mother! They’ll just taste that much better when harvest time comes.